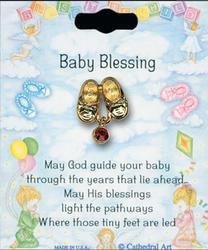 CATHOLIC GIFT SHOP LTD - Swarovski Crystal Baby Blessings Boot Brooch. Swarovski Crystal Baby Blessings Boot Brooch. Swarovski crystal baby blessings boot brooch with prayer. Card Size: 3" x 2 1/2"